You know as well as anyone that it's important to be connected. That's one reason you're part of Cornerstone. And yet, we also know it's hard to connect with others and build lasting friendships. We know that even defining community is tough because being in community is more than showing up for Bible study. It's also sharing food, laughing together, and doing what you love to do with people that have become important in your life. So consider this, what if you are one step away from discovering a new group of people who God wants to use to be a tremendous blessing in your life? 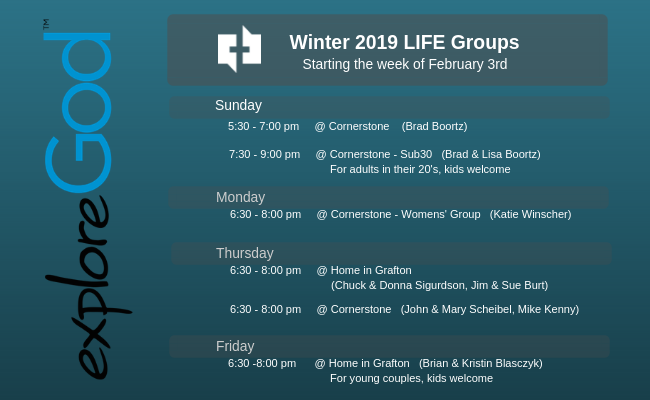 Our Winter Life Groups begin meeting the week of February 3rd. Check out the schedule for the 2019 LIFE Groups below. Then click on the link to sign up and let us know which group works for you.